Hello Stampers! Welcome to a fun new challenge over at Tuesday Throwdown. This week Sami Stamps is sponsoring and I am using this beautiful image called Bird Beauty for the Fall Feathers challenge theme. I used Copic markers to color in the image. 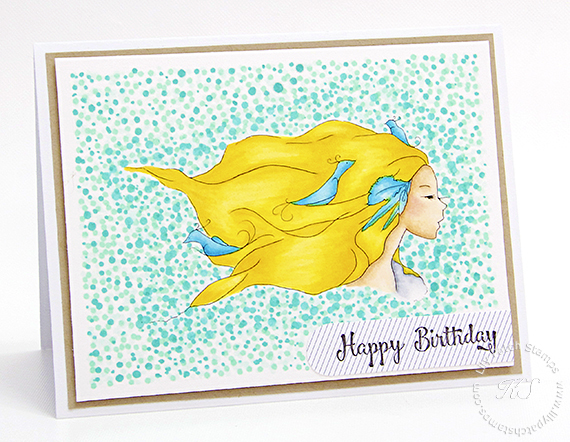 I created the background by using various shades of blue and left a 1/8" border white. I adhered the panel onto kraft cardstock using 3D tape to give it some dimension. The sentiment was stamped onto a grey striped cardstock. Please head on over to the TT blog for more DT inspirations and enter to win a fun prize from our Sami Stamps. Very cool card, Kim. Beautiful background AND COLORING TOO. THANKS FOR PLAYING ALONG AT HLS Case The Designer. Stunning! That bg is quite amazing, Kim. What a lovely project! Thanks for joining us at ATSM. You have done a very nice job with the project. I just love how you have created the background behind your image. Love the image too. Nice work. I love your coloring on that image, Kim! Fabulous card. Wow! You have a lot of patience! =P Love the stippled background. It is perfect for this challenge. Thank you for joining us at Sami Stamps for our Add Dots challenge. Brilliant background, love it. Thanks for linking it up at HLS. Gorgeous card! The image is beautiful, and I love the background. Thank you for joining us at Craft Your Passion. We would love to see you again!